Do you need a Traffic Management Plan, or MHT? When construction projects suspend the normal function of a roadway, construction traffic control plans need to be developed to assure the safety of the traveling public and the protection of the workers. 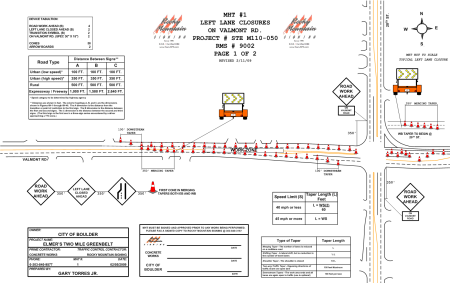 Rocky Mountain Signing can design and produce your Traffic Management Plan or MHT’s (Method Of Handling Traffic) which meets all requirements of the Colorado Department of Transportation and the City and County of Denver, as well as all other cities and counties in Colorado. 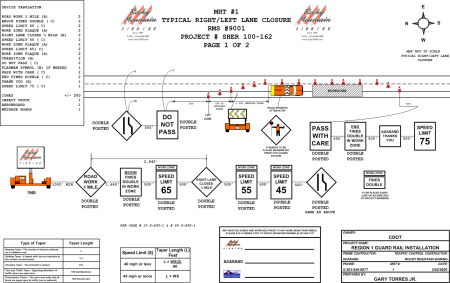 With over 27 years of experience, Rocky Mountain Signing understands how to create custom traffic control plans that will fit your road construction project’s specific needs. Our in depth knowledge and understanding of freeway traffic flow routes, local traffic flow routes, alternative routes and transit accommodations ensures that we will meet every need necessary in order to help plan traffic flow. We will determine lane assignments for freeway or arterial lanes and determine recommended routes and ramps based on the necessary closures for the project. We will also analyze local streets that connect to freeways and determine recommended flow routes for your traffic management plan to help keep traffic moving smoothly, while also identifying potential bottlenecks or problem locations based on the alternate routes available. All of our planning takes into account city, county and state guidelines to ensure that no matter what your project is, it will be done and done right. Not only can we help get your traffic management plans ready, but we can also take your project from the planning phase, all the way through erecting the final staging necessary to get your project started. 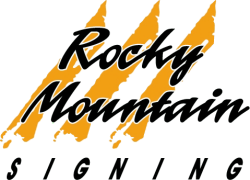 If it’s on the road, we can guarantee that Rocky Mountain Signing will take care of your traffic management plan needs. Give us a call today at (303)840-9877 or click here to send us a contact form to get started on your traffic control plans today.